Hello ladies! So today I have a special post to share with you, it's actually a collaboration I've been working on with a fellow blogger from Israel, Tal Peleg - who is an amazingly talented makeup artist! So how did it all begin? A week ago I've watched Katy Perry's new music video "Dark Horse", and I was inspired by the fun and colorful theme of this clip where she rocks these gorgeous makeup looks and fun nail art designs. I though this could be interesting to create a nail art design and a makeup look inspired by this video, and I was happy to have Tal join me on this fun project. 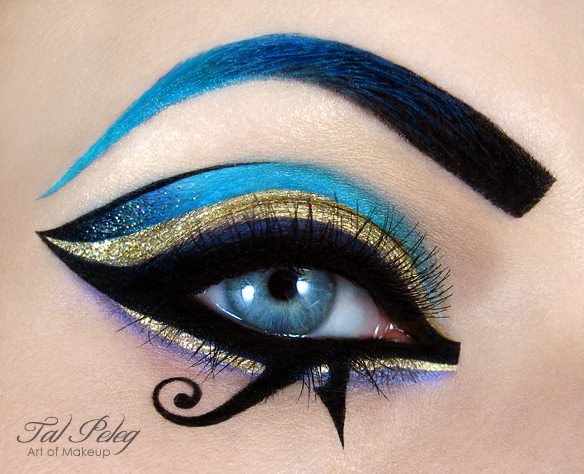 So for this post each of us created a look that was inspired by Katy Perry's Dark Horse video, and this is what we came up with! Keep reading to find out how I created this nail art and also get a closer look at Tal's makeup look. When creating this look, I was inspired by three nail are designs from this video and I came up with a little mash up version of my own. I can't say it was one of the easiest designs I've made, but I was so pleased with how it turned out so I'm very excited to share this look with you and hear what you think. For this nail art I chose to work with black, blue and gold color scheme that was very dominant in the clip. The colors I used are: Zoya Storm, Ga-De Blue Angel, Barry M Gold Foil and WOW Black & White. To create this design I used a few different techniques; I used sponging to create a gradient on the thumb, index and pinkie, then drew an contour line with a thin nail art brush at the base of the nail. For the Egyptian symbols and the gold shreds I painted squares on a plastic bag with gold and white nail polish, let them dry overnight and removed from the plastic bag once completely dry. I'm not sure how to name this technique but it's pretty common and I've see others use it before, then you can basically use scissors and cut it out to any shape you like. Creating the Ankh (represents the concept of eternal life) and the Eye of Horus (symbol of protection, royal power and good health) was pretty challenging and it took some practice, but if you are equipped with small scissors, a steady hand and a lot of patience - that's something that can be done. To make it easier to cut I printed the symbols on paper in the desired size, then aligned and taped it to over the dry nail polish sheet I prepared, and cut the shapes carefully. Cutting out the middle was pretty much impossible with such small shapes, so I found a way around it - with the Ankh I just painter the inside of the loop with black polish, and with the Eye of Horus I cut through the middle (you might notice a small cut on the left corner of the eye) and then I just had to add the apple of the eye with a dotting tool. I know it's way too much information, but I wanted to make it as detailed as possible so hopefully you can understand how I created these shapes. You might wonder why I didn't just paint the symbols over the nail with a thin brush, well I've tried this at first but it didn't turn out exactly how I imagined it and the result wasn't as crisp and precise. I'm glad I went for the cutting out option, I think it turned out perfect and exactly how I imagined it, so the hard work really payed off! All I had to do now is layer the shapes I created on the nails and top it with a top coat to smooth the design. To bring the nail art to life I equipped myself with some gold jewelry from my collection. I'm wearing my mom's Vintage Amber Ring and some stacking rings from Galisfly. I'm also wearing a gold pyramid studded bracelet that I got from asos.com. I think they are a great addition to the Egyptian look and feel. I had so much fun creating this design and I was super thrilled when it turned out even better than I imagined it! A little challenge once in a while can't hurt, but I feel like it will be pretty hard to create a design that will top it off. Here's another look at Tal's makeup art! I was thrilled to hear that she liked my nail art and decided to go along with it in her makeup look, it turned out fantastic! Be sure to check Tal Peleg's blog and to follow her on facebook and instagram for more amazing and creative makeup looks. You will be amazed to find out what can be created with only makeup, fine brushes, and a huge talent! Wow! This is incredibly beautiful! All I can say is HOLY FREAK!!!! I am so amazed by the detail, precision and beauty of your mani! It is so creative and I love the collaboration! OMG! :) Sooo cool :) You've got talent :) I always knew it, but now I'm anmazed even more! Wow! Really spectacular Natalie! All your had work and cutting out the designs paid off. The images are so crisp and clean! Just so gorgeous!! love it too much!!!! you both did an amazing job! Wow! Just... wow! Amazing artwork. I don't think I'll dare to repeat Ankh or Eye of Horus symbols anytime soon, but the idea with golden pieces on your index and pinkie - now this is something I could pull off, I guess :)) thank you very much for the description, it is really inspiring. ThIs post is amazing! Def gonna read your blog more often! !! I don't know how to describe my love for this nail art and the perfection of the details. The gradient is spot on, incredibly well blended, and that semi-ruffian at the base is amazing. The lines are so sharp and crispy! The decals were a very good idea! Good job, always inspired by your work. Love everything about the nail art and the make up, such an artwork! This is just stunning! I love your thumb, wow! Amaaaaazing! I wish I could see this in person, it looks so beautiful! Wow! that's just perfect! Stunning! O.o girl, this might be the coolest thing EVER! I really think you should send a picture to Katy Perry's management, they should let you do her nails next time :D! Wow, the eye makeup looks amazing! I love your Katy Perry Dark Horse Nails- Hot like Fire. This manicure is seriously amazing, soooo gorgeous!! Wow wow wow this design is amazing, breathtaking!!! I love it and you're challenging me to make it too!! Well I'm not sure to be as talented as you. This is beautiful! A whole lot of technique went into those nails, it's pretty amazing! I have no words... this is absolutely perfect!! !